I have to tell you that when I was trying to plan out the nursery, I was a little nervous about how it would turn out. But each day we work on it I get more and more excited. Here's my new favorite thing- the armoire. I love the way all of her blankets and sheets look all folded up and there's a bar to hang her dresses on! I took these pictures on Saturday morning and when Marc went to use our camera on Saturday night, the screen was broken! You can't see anything! 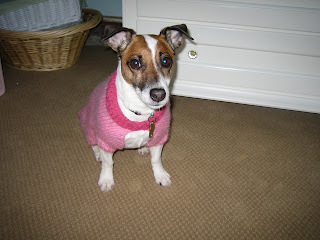 We've had our digital camera for almost 5 years and are very sad to part with it. This week will be spent researching what to get as a replacement. This quilt square is from a retired teacher that I worked with during my first year at my current job. Fortunately, I'm able to stay in touch with Kathy through book club, as she has become a very special friend. The material she used for her quilt square is the same material she used over 30 years ago to make a pillow for her parents. 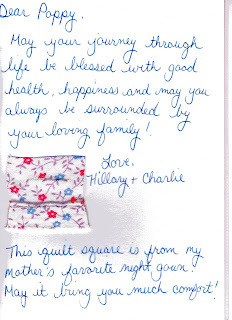 And this next quilt square is from another friend I work with, Hillary. 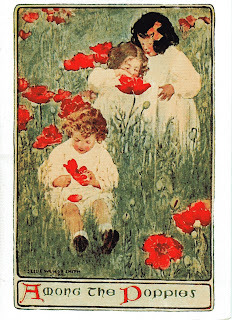 The poppy picture is the from the front of a card that is made by a local artisan. Hillary has given me this card before and I am planning on having it framed and putting it in the nursery. That is a beautiful armoire. I really love it. Oooooh the armoire is really nice. I also love the carpet. Lola looks like she thinks that is her room. I guess it can be until Poppy comes home. wow! I'm ok with having a little boy--but I still envy all of the neat stuff that girls get!! What an awesome armoire!! It's so exciting putting everything together, isn't it? Who knew that folding blankets and clothes could actually be fun? 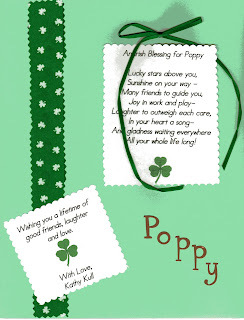 ps--loving the shamrock quilt square. Your nursery looks lovely! I love the armorie. 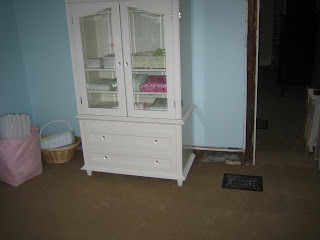 I love the armoire!! Lola looks very excited to meet her big sister!! !